We’re offering free fitting* on all Michelin tyres when you purchase 2 or more car, van or SUV tyres, online or in-centre. Save £26 when buying 2 x tyres, £39 when buying 3 x tyres or £52 when buying 4 x Michelin tyres. This offer is valid on tyre purchases made in a single transaction online or in-centre between 1st March 2019 and 30th April 2019 (inclusive). Terms and conditions for this offer can be found below. *The offer of Free Fitting applies in relation to the standard charge usually made for fitting the tyre which includes one tubeless rubber valve, one tyre balance and one disposal of the old tyre. No allowance will be given where any of these items/services are not required. *Any other items or services that are recommended or required as part of the tyre fitting service that are not part of the standard fitting requirements and are not listed above (e.g. TPMS valves (tyre pressure monitoring system valves), metal valves, wheel tracking etc.) are not included in the offer and will be charged for separately. ATS Euromaster’s Retail Customers will receive a Free Tyre Fitting Service* when purchasing 2 or more MICHELIN car, van or SUV tyres for a single vehicle in a single transaction between 1st March 2019 and 30th April 2019 (inclusive). Offer is only available on Michelin car, van or SUV tyres. This offer is available to Retail Customers only. It is not available to ATS Euromaster’s Business or Account Customers. By participating in this offer, claimants agree to be bound by these terms and conditions and by any other requirements set out in the promotional material. 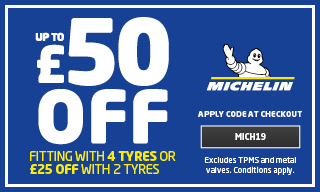 The offer is available to customers purchasing eligible MICHELIN tyres from a participating ATS Euromaster Service Centre or through the ATS Euromaster online shop (https://www.atseuromaster.co.uk/consumer). 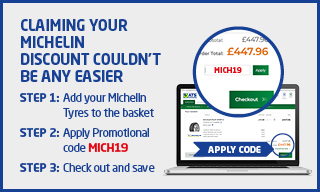 When purchasing 2 or more eligible Michelin tyres online, save with code MICH19 at checkout. All tyres purchased under this offer must be fitted by ATS Euromaster at an ATS Euromaster Service Centre at time of purchase. For online purchases the fitting appointment should be made at time of purchase. This offer may not be used in conjunction with any other discount or offer for the same product or service other than the promotion specified below. Customers purchasing Michelin tyres may obtain a free fitting discount with the ‘Free Fitting with Michelin tyres’ Offer AND (where a qualifying amount of 4 tyres is purchased in a single transaction) claim a free Amazon Fire Tablet with the ‘MICHELIN Amazon Fire’ Promotion. This offer is subject to stock availability. There may be some tyres which ATS Euromaster is unable to supply, please ask in Centre for details. No cash alternative is available. ATS Euromaster recommends that new valves are fitted to tubeless tyres and that wheels are balanced upon fitting. The Offer and these terms and conditions are subject to English law and the exclusive jurisdiction of the English Courts. Promoter: ATS Euromaster Ltd, 20 Upper Portland Street, Aston, Birmingham, B6 5TW.